We all know how getting out of bed can be a chore for the less driven personality (that makes up the most of us), and more often than not we view alarm clocks as irritating devices that blare their blasted tune incessantly until we have to physically shut them up. 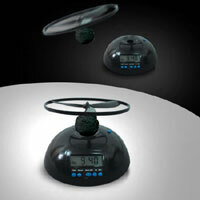 The Flying Alarm Clock has certainly proven it’s mettle as a formidable device that is more than capable of waking up even the most battle hardened sleeper, as it literally takes to the skies (or as far as your ceiling permits), flitting around with the noise of an annoying mosquito in it’s efforts to jolt you out of your slumber. To keep it silent, all you need is a fly swatter. Nah, I’m kidding – you will first have to get up and catch it. There really isn’t any point turning on the Snooze mode as it will take off from it’s base after a designated amount of time, repeating the irritating process all over again, hence it is advisable to just get up and greet the new day with enthusiasm. Those who sleep with their windows open might be distressed to find out that their alarm clock has literally flown out of the window, leaving them no avenue to wake up. Of course, you could be stubborn and refuse to get up, letting the Flying Alarm Clock grace the ceiling space in your room until it’s battery is exhausted, where it will then drop to the ground with a spectacular crash. I doubt that anyone would want that to happen as you wouldn’t want to fork out £19.95 for a replacement each time it crashes and burns. Wow your wall is burning beautifully!